UX design is now an important part of creating design that works for people – it’s been somewhat under the surface for years, and is now being rightfully acknowledged. I’ve used elements of UX design in my work for years, but felt it was time to learn more about the proper processes and stages involved, and explore the importance of researching and testing every step of the way. 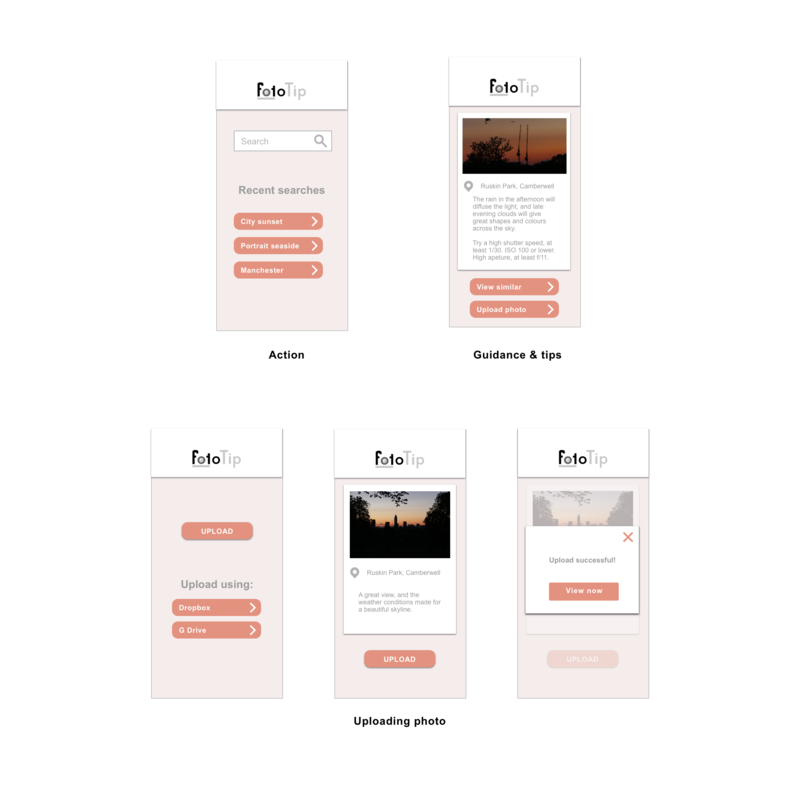 I chose to create a photography app called FotoTip, which would help amateur photographers produce better photos through technical guidance and inspiration. As a photographer myself, I know there are no hard and fast rules for taking the perfect picture, but alerts for perfect weather conditions, on-the-spot knowledge and inspiring example shots, would be something I would find useful and know others would too. 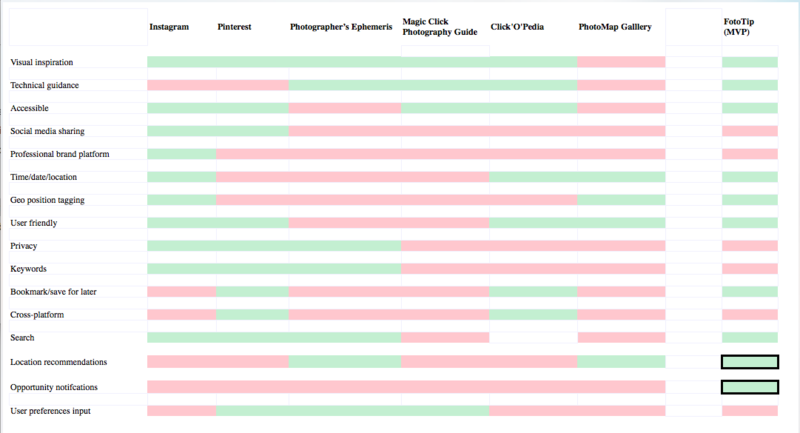 This formed the basis for my USP, as my competitive analysis showed that while numerous apps and companies offered either inspiration (e.g Pinterest and Instagram) or technical guidance (e.g Photographer’s Ephemeris and PhotoMap Gallery), very few offered both to a high standard. 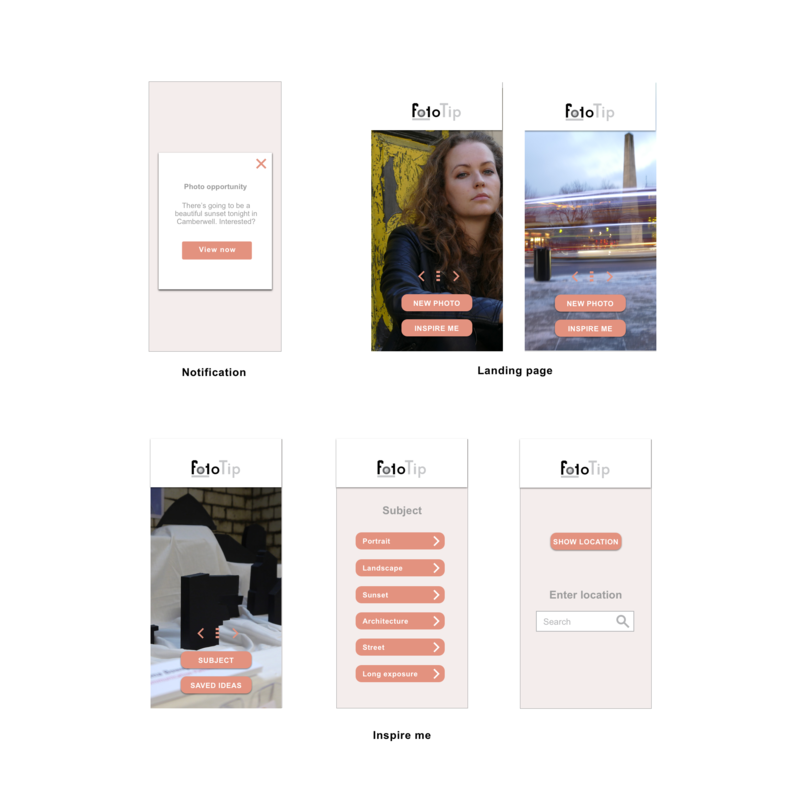 So there really was a gap in the market for an app like FotoTip, and this helped guide me to what aspects I should prioritise when creating my Minimum Viable Product. I started with a round of user interviews, covering questions specific to FotoTip as well as more general queries on the interviewee’s reasons for getting into photography, do they plan their shoots in advance, how they share their images, and what brand of camera they own. 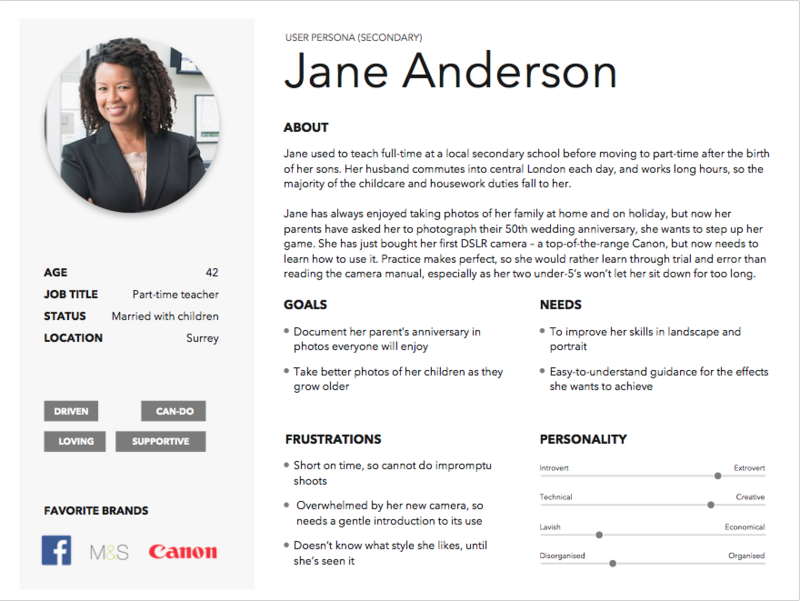 These interviews helped me produce user personas (view here and here) based on who I believe the app would most appeal to, and what barriers they would likely have to using it. 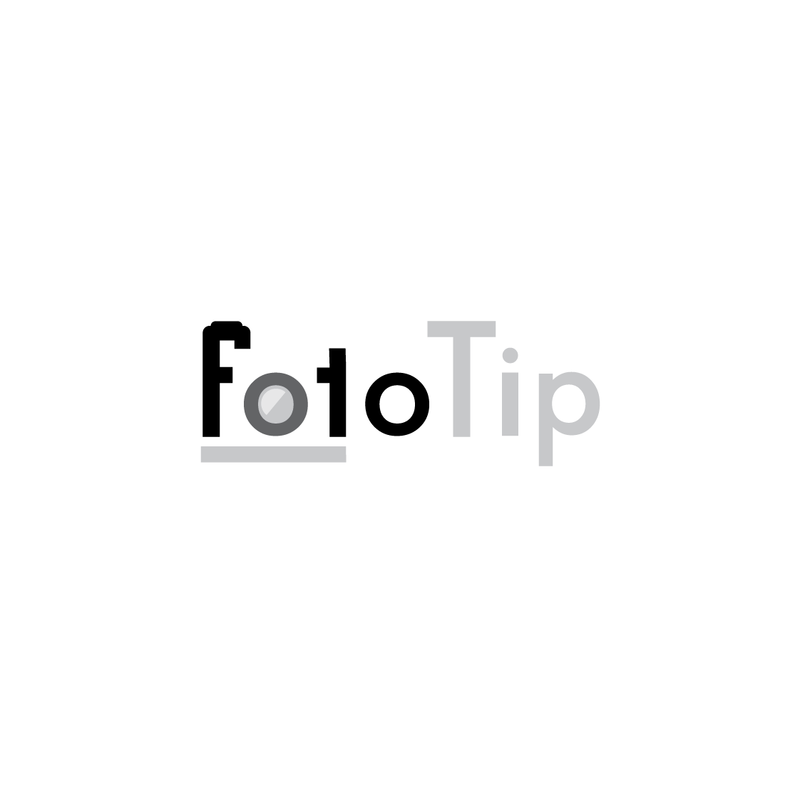 I organised FotoTip into 2 main ‘flows’: inspire and action. I went through a few stages while creating my user flow; initially producing a sharpie sketch so I could work out the most important aspects, followed by a mock up using post it notes which allowed me to identify pain points in the flow and how I could link the two separate paths together. 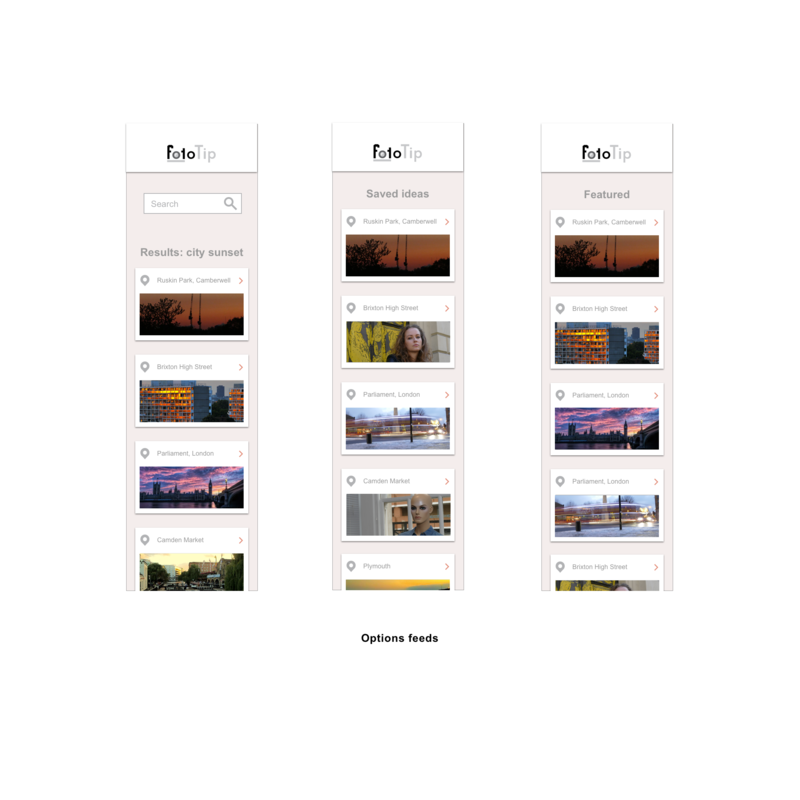 Finally, I created a detailed user flow in Sketch, which showed choice stages, filter options, and the 3 main stages of the whole process. 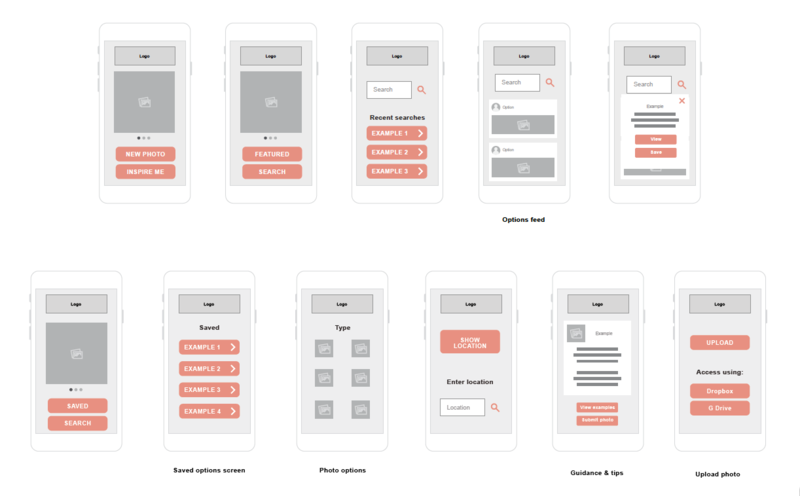 I first produced a series of low-fidelity wireframes on paper to ensure the basic design was easy to follow, and then an initial set of digital wireframes and a working prototype using Sketch and inVision, which I ran usability tests on. Feedback from this stage was then taken on board for the creation of a series of high-fidelity wireframes, and the finished prototype.